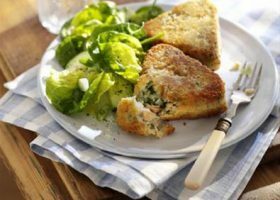 Salmon from the store-cupboard often comes to my rescue when I want a quick supper for the kids, and once you’ve tasted these you’ll agree that this is one of the best ideas yet. I like to serve them with sweet chilli sauce, which can be made at home by mixing four tablespoons of tomato ketchup, one tablespoon clear honey, quarter teaspoon of chilli powder and the juice of half a lemon. Cook the potatoes in a pan of boiling salted water for 10-12 minutes until tender. Drain and mash well, then stir in the salmon, spring onions, parsley, soured cream and lemon rind; season to taste. Divide into eight portions and shape into triangles. Mix the flour and paprika on a plate, then season to taste. Place the beaten egg in a bowl and the breadcrumbs in a shallow dish. Dust the salmon triangles in the paprika flour, then dip in the egg and coat in the breadcrumbs. Heat the oil in a non-stick frying pan. Add the coated salmon triangles to the heated frying pan and cook for 3 minutes on each side until crisp and golden brown. Drain well on kitchen paper. Arrange on plates with some salad and a spoonful of the sweet chilli sauce.